Greece is an amazing place to visit, whether if you are a history buff, you will be spoilt for choice here with the vast length of history that Greece was part of. It is the birthplace of Western civilisation. Perhaps no nation in Europe can boast of a more ancient history than Greece. Greece's antiquity dates back to 3000 BC when the powerful Cycladic, Minoan and Mycenaean civilisations flourished here. The evolution of powerful city-states, especially Athens and Sparta, between 800 and 500BC produced the classical age of Athens which was the high point of the Grecian civilization. When we visited Italy, we were blown over by the amazing antiquities and ancient historical sites there. After visiting Greece, we were overwhelmed by the multitude of archaeological treasure the country possesses. Not only does Greece offers history, she also provides tourists with amazing restaurants, beaches, nightlife and scenery. After an uneventful flight from Singapore to Athens via Doha on Qatar Airways, we reached Athens. We had booked ourselves into Fresh Hotel in Athens for a very reasonable 110 Euros per night. The hotel was situated across from Omonoia Square with its own metro stop, so very convenient for getting around Athens. Furthermore, the sightseeing bus has a stop near to the hotel. Sorry that I didn't take any pictures of hotel. You can check out the hotel details here. We had 2 days in Athens, so we spent Day one taking the Hop on & Hop off sightseeing bus and did a round around Athens. I like to do that as it gives me a prospective and an orientation of the city prior to proper sightseeing on foot. The ticket is valid for 24 hours and you can hop on & hop off as like you. Here are the stops: Stop 1 - (Syntagma Sq.) Stop 2 - (Melina Merkouri, Plaka) Stop 3 - New Acropolis Museum Stop 4 - Acropolis & Parthenon Stop 5 - Temple of Zeus Stop 6 - (National Gardens) Stop 7 - (Benaki Museum) Stop 8 - (Panathenaic Stadium) Stop 9 - (National Gardens) Stop 10 - (National Library) Stop 11 - (National Archaeological Museum) Stop 12 - (Omonoia Square) Stop 13 - (Karaiskaki Square) Stop 14 - (Thession Station) Stop 15 - (Kotzia Square). The sightseeing bus took us past all the famous sights in Greece. From Syntagma Square where the Greeks gatherting to protest against the Greek Government, to the Panathenaic Stadium where the first modern Olympic games were hosted in 1896! We also went pass the University of Athens which must be the grandest university building ever!! Other sights that the sightseeing bus takes you round are: Arch of Hadrian, the Temple of Zeus and of course the Acropolis. A suggestion is to take a walk through the Arch of Hadrian to reach the Temple of Olympian Zeus. It is amazing to see what remained of it which was first in 6th Century BC and finished in 2nd Century AD, some 638 years later during Hadrian's reign. Fifteen columns remain standing presently with the 16th that fell due to a storm back in 1852. At the Syntagma Metro station, you can find amazing historical relics found when the station was being built. Not only it is the main transportation hub in the city center, it doubles as a museum, housing all the finds during the excavation of the grounds to build the metro. The walls are the ancient graves from Ancient Greek, Byzatine period & Early Christian time on top of the other. We also took the time to check out the changing of the guards at the Parliament. Even though, it is not as grand as some of the other changing of the guards, it is still very interesting to watch. 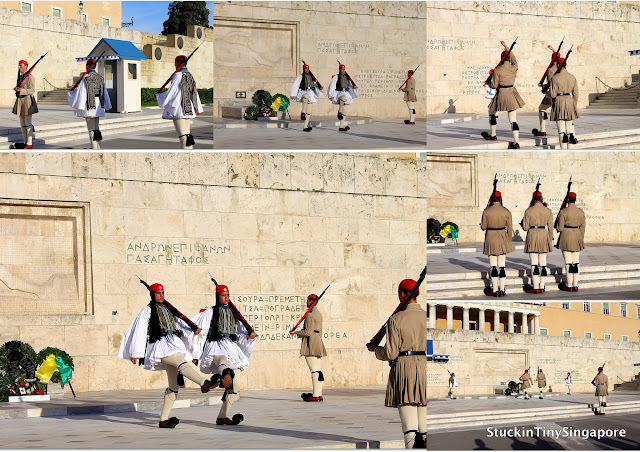 The costumes worn by the guards reflects the different areas and eras in Greek history. There is the pleated kilt along with the brightly decorated footwear. The kilt dates back to ancient Minoan times (4000 years ago), where the Cretan men used to wear. We finished our day exploring parts of Athens. The next post will be on our visit to the Acropolis, the most visited attractions in Athens. wow so nice pics.I like it and i want to visit that places.Thanks for this post. Very well described. Thanks for posting the beautiful pics.